Back when I was a kid in the late 80s and early 90s, game music didn't seem like anything special. Sure, I knew the Mario Bros. Rap and could hum the theme to Sonic the Hedgehog, but no game music ever captivated me. Then I played Final Fantasy VI. To me, game music had always been short, catchy tunes—little more than a complement to the sound effects. But the music in Final Fantasy VI was different. Instead of simple melodies designed to keep the game upbeat and exciting, there were grand orchestral scores (though rendered in 16-bit midi, of course) that played on a wide range of emotions. And then there was the opera scene—a gaming moment I remember in perfect clarity nearly two decades later. It should be said that, while I had had the game recommended to me, I was going through it completely unspoiled. Before playing FFVI, I had never even known games like it existed—much less heard the term “RPG”—so I had no foreknowledge whatsoever. Thus, when my party entered the opera house and Celes was whisked away to go from reformed enemy general to “opera floosy,” I had no idea where the game was going or what to expect. But as Locke came into the dressing room to wish Celes good luck, it hit me: I was going to perform an opera in a video game. I should point out that, before CD-based systems like the Playstation, the very idea of a “music game” seemed laughable. Thus actually performing an opera in a game seemed like insanity. Yet as I checked the score and saw that it was, indeed, a full song, I did what gamers did back when the internet was in its infancy: I took out my notepad and wrote down the whole song. Then, I spent the next hour doing my best to memorize it. Finally, feeling at least somewhat prepared, I started the scene. The curtain rose and the opera began. The narrator began setting the stage: a war between East and West. Two lovers, Maria and Draco, one lost in the war. Maria is left alone, trying to live a new life in her conquered country. It had nothing to do with the overall plot of the game. There were no Espers or magic, no Empire or Returners. But the story within a story was captivating (and heartbreaking) nonetheless. And then Celes came on stage to sing Maria's aria to her lost love. I followed the stage directions in my notes and chose the next correct line in the song when offered the choice (though part of me was saddened in retrospect that I didn't get to choose single every line). And as it continued, and the music enveloped me, I became more than a little choked up. Only looking back do I realize why. It was simply the most beautiful, emotional, and captivating moment in my gaming life thus far. The play went on, a giant talking octopus who seemed equally at home on water or land showed up to crash the play, and everything ended with Celes' kidnapping as planned. Even then I knew what I had just played had been something special. Upon the completion of the scene, I began saving to the second save slot so that I could revisit that scene at leisure. Eighteen years and countless playthroughs later, that save remains. And even as I continued on during that first playthrough, the opera song—the “Aria di Mezzo Carattere”—continued to affect me. It shows up throughout the game as Celes' musical theme and is played at all critical character moments for her—sans her original introduction which takes place before the opera scene. 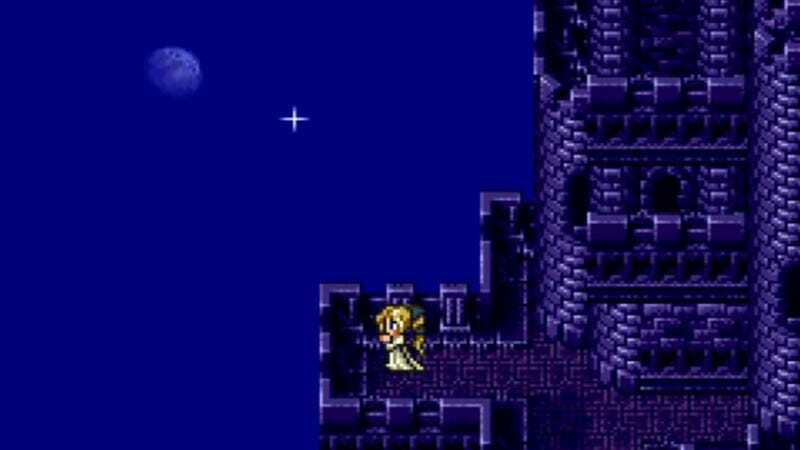 It also fills the background of the game's grand emotional climax: Celes' suicide attempt on the Solitary Island—a scene that I'm not ashamed to say had the 12-year-old me in tears. The “Aria di Mezzo Carattere” remains to me the pinnacle of music in games. It is a song I have listened to constantly ever since. I have seen it live with real singers in Japanese (and in English on good old YouTube); and even all these years later, I still get a bit misty-eyed listening to it. In my mind, no musical game moment has ever topped that first time I set foot onto that 16-bit stage; not one has affected me so profoundly.